Although the city's selection of tourist attractions may not quite match the caliber of those nearby, within the Greek capital of Athens, Piraeus stands on its own two feet when it comes to sightseeing. Tourists wishing to get a feel for the city of Piraeus really must make time to check out the attractions within the wealthy neighbourhood of Castella, where the panoramas are quite likely to take your breath away. 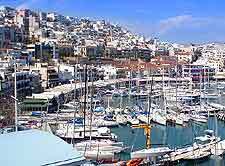 The Great Harbour of Piraeus is perhaps the city's biggest of the city's tourist attractions and remains the main port for the neighbouring city of Athens, being the harbour where huge numbers of ferries depart daily, heading for the Greek islands and coastal cities around Italy. Simply taking a stroll around the Great Harbour is a very pleasant way to spend an afternoon sightseeing, looking at the countless glamorous yachts around the marina area and enjoying a bite to eat at one of the many harbourfront cafes, where you can sit down at an outside table and watch the boats and cruises ships coming and going. Other attractions around the Great Harbour include plenty of gift shops and boats offering day trip excursions to the nearest islands. 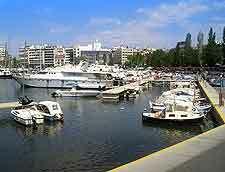 Located across the peninsula is the Zea Marina, and it is from this port where regular hydrofoils zoom off around the Saronic Gulf. Visitors to the Hill of Castella will be able to experience some extraordinary views across the Saronic Gulf and the capital city of Athens, so do make sure that you bring your camera to capture these memories. You will also see large numbers of traditional Greek houses, which are squeezed together on the hill and almost appear as if they will soon be falling into the waters below. The Hill of Castella also offers plenty of restaurants and ice cream shops should you require a little refreshment, and during the summer months, the nightclubs pump out Greek dance music until the early hours of the morning. A very appealing and traditional working-class neighbourhood, Kaminia is a prominent quarter of Piraeus and offers a true taste of life in Greece. However, most tourists come to Kaminia to pay a visit to the Olympiacos CFP (Olympiakos Syndesmos Filathlon Peiraios), a popular sports club known for its football club and highly successful basketball, volleyball, water polo, sailing, rowing, athletics and boxing 'departments'. Being so close to the world's capital of the Olympic Games, it will come as know surprise that Piraeus is home to a couple of exceptional stadium attractions. 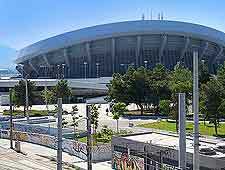 The Peace and Friendship Stadium is particularly impressive and lies within the Faliro coastal zone, some 2 km / 1.5 miles from the city centre. 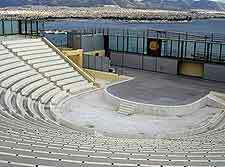 Recently upgraded, the state-owned Peace and Friendship Stadium has a capacity of around 11,000 and was used as a venue during the 2004 Athens Olympic Games and hosted the volleyball tournament. Much larger and able to accommodate over 33,000 seated spectators, Karaiskaki Stadium was also used during the 2004 Olympics and dominates the coastal Possidonos Avenue. 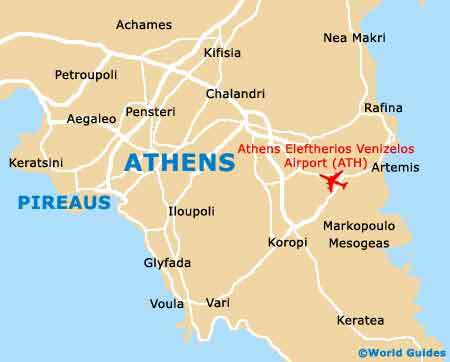 More information about Athens Tourist Attractions.